Last night was the second Surrey & Hampshire Hackspace session I have attended at GamesGalaxy in Farnborugh. 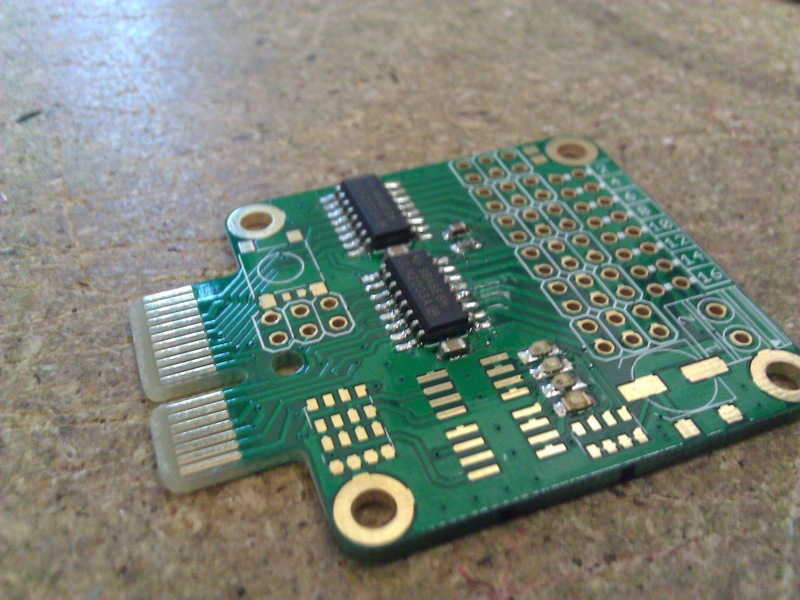 Last time I had planned to solder up my Raspberry Pi interface for a remote control car but got sucked into the excellent Eagle tutorial by Bob, so this week I was determined to get it done. 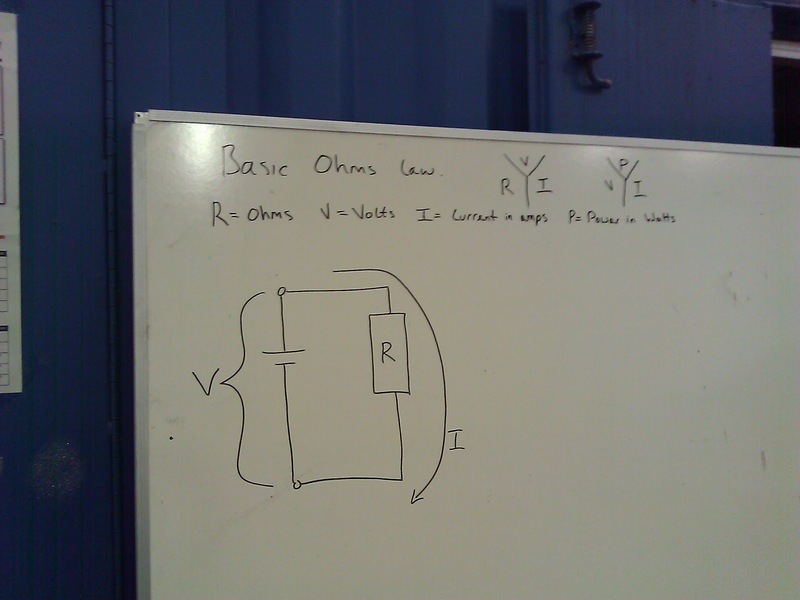 While I was quietly getting on with stuff Bob for his second tutorial gave an introduction to Ohms Law. 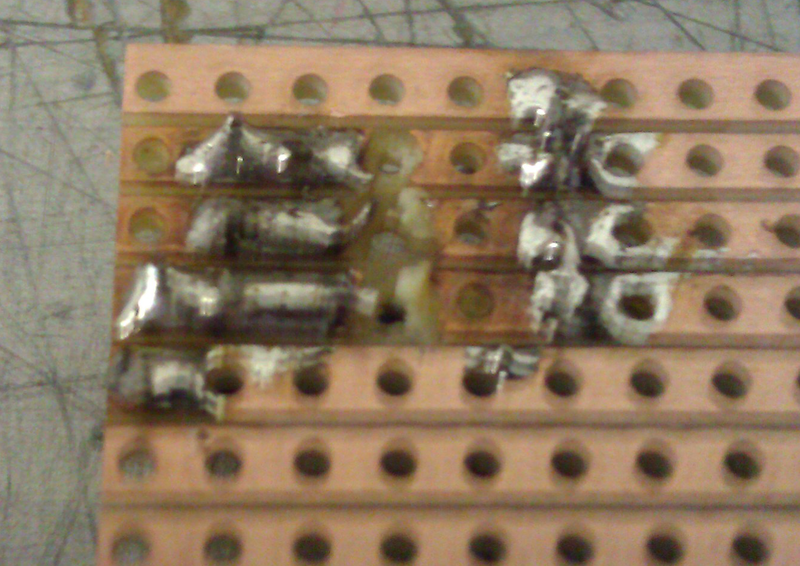 Alan was soldering up an SMD board. A lot more complex and precise than my efforts. Not sure the circuits purpose but as you can see from the pictures Alan had 2 soldering irons at his disposal. For the remote control project I needed to move the components from a proto-board that due to the number of wires hanging off it causing too much interference and stopping the remote from working reliably. I wanted to build it on a stripboard to get rid of all the wires and also as a small, simple introduction to using stripboard as this was my first time using stripboard. When I arrived I realised I had left my computer at home and in it’s case were my notes. Nothing too detailed but not a great start. I also left my soldering iron at home so a quick trip to Maplin around the corner sorted that out. So began the task of taking a simple circuit with 4 components and figuring out how to do it on stripboard. It’s amazing how something that makes perfect sense on a proto-board suddenly appears more complex than it needed to be. After a bit of head scratch I figured out the layout and it only used 5 strips. 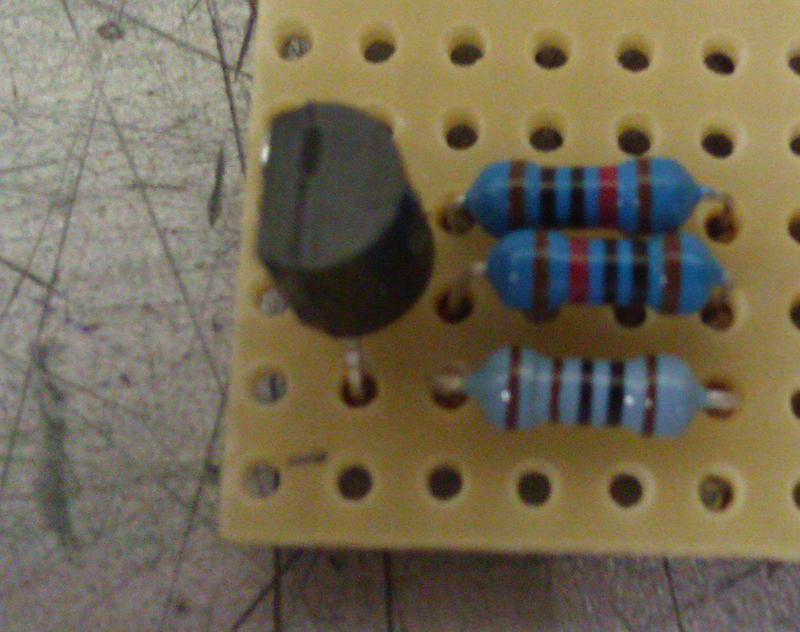 one for 0V, one for 3V (from remote) and 3 for the transistor and the 3 resistors. 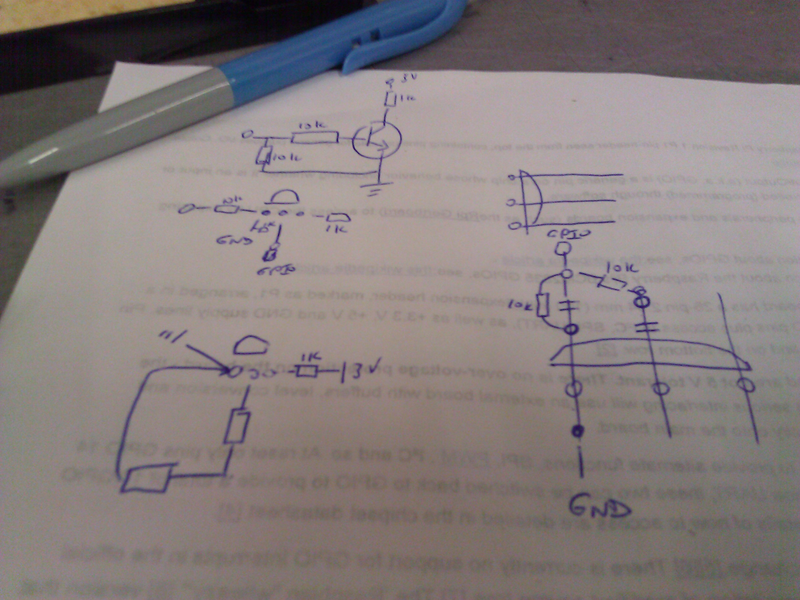 Hopefully a nice neat circuit. I then turned the board over to start placing components and thankfully Doug pointed out that I needed to mirror the circuit compared to put the components in on the strip side. I expect this saved me a lot of troubleshooting later on. 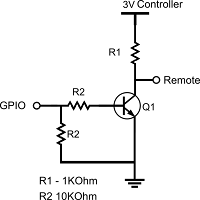 I soldered in the first circuit after figuring out the mirrored circuit and where I needed to cut the tracks to make it work. Really happy about getting it done and was then about to solder in the second circuit when Robin popped over so I explained the layout and again noted a mistake. I was missing a location where I could take the output to the remote. 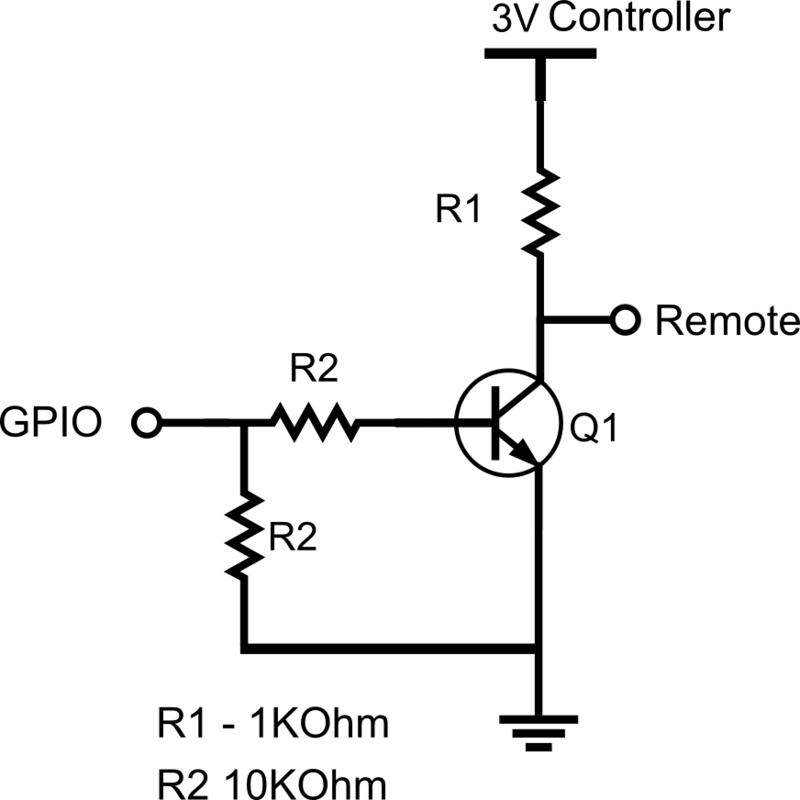 If you look at the hand drawn circuit above there is no output at the transistor. Whoops, another mistake averted. I had to move the transistor forward one hole to create the point where the remote wire would attach. If you look at the 1st solder side picture above and the final one below with the 4 circuits in place you will see the one on the left has moved to the edge with no spare holes left. Lucky I had the space to move it. Also, on the first one I thought I’d be clever and use the legs of the resistors to do the bridging by just bending over the pins and soldering them. It worked perfectly, but looked a bit of a mess so I decided for the other three I would use jumper wires on the top of the board. 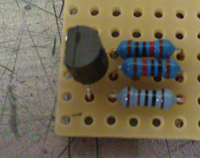 That is why there are no jumper wires on the first circuit but the other three all have small jumper wires. Here is the final layout for 1 of the circuits as a schematic diagram and also on the strip board. 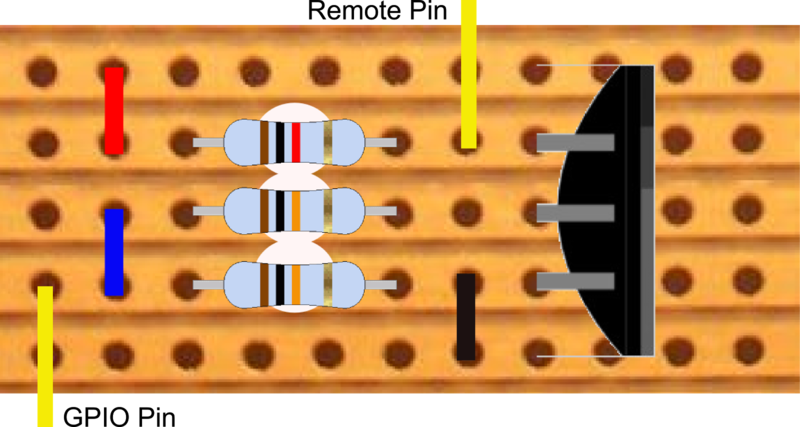 I put the jumper links on the strip side for illustration purposed but you can see for 3 of the 4 circuits above the jumpers are on the top. So, that was it all wired up. I then added the wires to connect to the remote control and the wires to connect to the GPIO pins on the Raspberry Pi through the Adafruit PiCobbler. After hooking it all up and attaching a screen and keyboard I loaded GPIOScratch, Opened my test code and it worked. Sending commands from Scratch on the Raspberry Pi made the car drive. All the problems I had with interference due to the tangle of wires have been fixed and I now have a reliable circuit that I can possibly bring into the CodeClub I run to show the kids that Scratch is not just for making a cat run around the screen. In my joy it slipped my mind to photograph the finished circuit all wired up to the remote and the Raspberry Pi. So, for the next post I will do some more pictures, a video and show the Scratch Code. 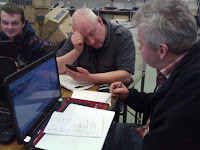 It was an excellent evening at the Surrey & Hampshire Hackspace and next get together is the 21st of February. If this type of thing interest you then visit the website and join the mailing list. Or even better come along on the night. For more going on you can follow on Google+. Roll on the 21st and some more computing and electronics fun.